We have compiled a new Windows binary from of sgminer version 5.1.1 from the latestsource as it includes some fixes and optimizations since our last binary release. The latest sgminer 5.1.1 should also have better performing WhirlpoolX implementation thanks to Wolf0’s kernel getting integrated. The idea of the official sgminer is that it combines almost all of the available algorithms in a single miner package and that is what makes it useful for GPU miners along with a functionality that should allow you to easily switch between them. Do not that the performance of all of the various kernels included in the official sgminer may not be as optimized as in some dedicated releases for a specific crypto algorithm out there. Earlier this month when sgminer has been updated to version 5.1.1 (source) it has turned out that there are some issues with the newly added Lyra2RE support. This issue has been addressed and now the latest sgminer 5.1.1 should have no more trouble mining Lyra2RE on compatible OpenCL GPUs, so you might want to give it a try, though it might not be the highest performing Lyra2RE miner out there. 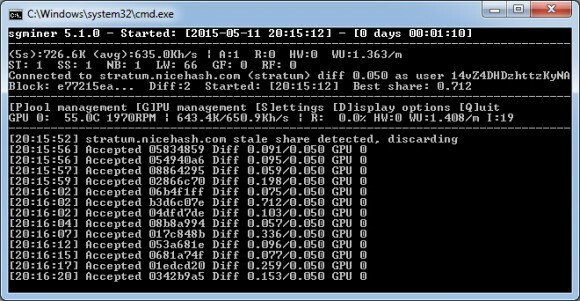 The idea of the official sgminer is that it combines almost all of the available algorithms in a single miner package and that is what makes it useful for GPU miners along with a functionality that should allow you to easily switch between them.